I spent a little time this morning in our garden pulling weeds and cutting paths through the clover. I like the look of the clover growing wild but it was beginning to get hard to walk back there so I made some paths, left some patches in some places and cleared the space in other places. 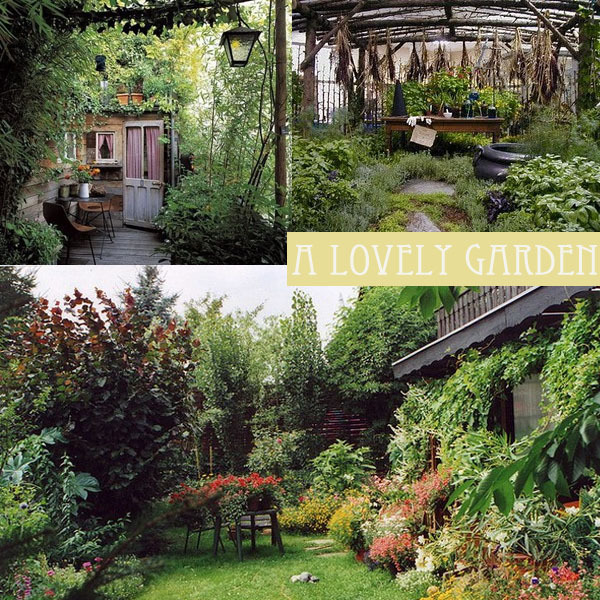 I am thoroughly inspired by lush, overgrown gardens that are obviously manicured but still have that wild feeling. It's a heart racing kinda inspiration...they are so beautiful...like these pictured above!! Especially that herb garden how yummy is that and the overgrown entry way. These are all things that take time to grow, lots of time to develop into that heart satisfying urban forest like overgrowth. A real test of patience and my I want it now attitude but there is not much way around it here now is there. How do you like your garden?